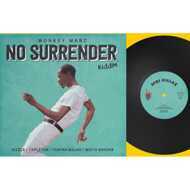 No Surrender Riddim EP is a limited edition release from Monkey Marc's new Jamaican project with only 500 copies pressed. Pressed on a 10" vinyl and mastered at London's bass heavy giants Transition Mastering, this vinyl pressing weighs and sounds heavy. In an era of transient digital production throughout the modern music industry, Monkey Marc’s production hearkens back to the classic sound of golden era hip hop and the raw energy of 90s dancehall. No Surrender was produced on an MPC3000 and an ATC1 analog synthesizer, and tracked through a vintage BBC broadcast mixing console in Monkey Marc’s solar-powered studio in Melbourne, Australia. This 10" vinyl includes versions by Sizzla, Fantan Mojah and Capleton, the instrumental version, and the title track with the three artists. Additional production by Mista Savona (Havana Meets Kingston).